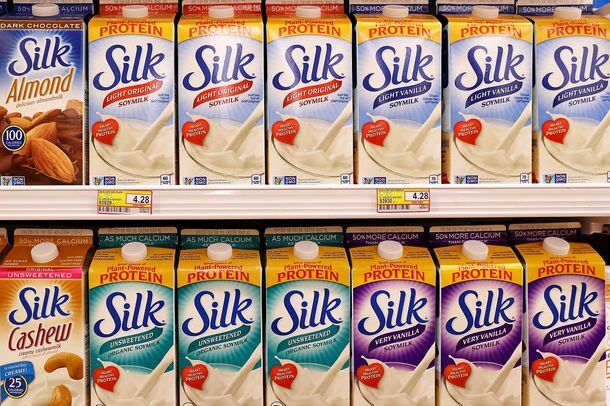 The FDA Wants Almond- and Soy-Milk Companies to Stop Calling Themselves ‘Milk’It’s still a long shot, but prepare yourself for the possibility of “soy drink” and “oat juice” anyway. San Francisco Schools Ban Students From Drinking Chocolate MilkThe city’s school district has found a new way to reduce students’ sugar intake. Congress Acts to Create the ‘Golden King’ Crab America DeservesThe new spending bill gives Alaska’s brown king crab a more elite name. Experts Keep Speculating About What Trump’s Victory Means for the Food IndustryThe president-elect is clearly pro–fast food. England Orders Food Industry to Slash Added Sugars by 20 PercentIt’s the U.K.’s most serious effort yet to curb childhood obesity. Big Food Scrambling to Yank Added Sugars From ProductsMajor nutrition-label changes are coming in 2018. Congress Suggests Legitimate ‘Sell By’ Dates Might Curb Food WasteA new bill says a national labeling standard would keep safe food out of the trash. The FDA Moves to Fix Its Broken Definition of ‘Healthy’ FoodRight now Pop-Tarts qualify, but salmon does not. Politico Launches Food-Policy CoverageThe shutdown and your pantry, explained. Shuanghui International’s Smithfield Foods Merger Given Green LightPorktastic. Prospective Buyers Offer More Money for Smithfield FoodsMaybe former spokesperson Paula Deen is a silent partner. Chinese Meat Producer Buying Smithfield Foods Had a Maggot ProblemSomething is rotten here. Stringer Pitches Food Strategy Plan for CityThe Manhattan borough president picks his issue, and eats it.